Last week was a doozy and I'm just so happy to have a new week. It's time to hit the reset button- especially with my grazing, out-of-control eating patterns that re-emerged this week. I am stressed at work and stressed about my foot. And because my foot has been acting up, I haven't been as active as I was all through the summer. I am hopeful that the MRI this Wednesday will shed some light on what's going on, how to fix it, and how to lessen the pain. I ran the Divas Half Marathon DC yesterday and it did not go as planned- but we finished! And it was Jen's first half! Stay tuned for the recap later this week. 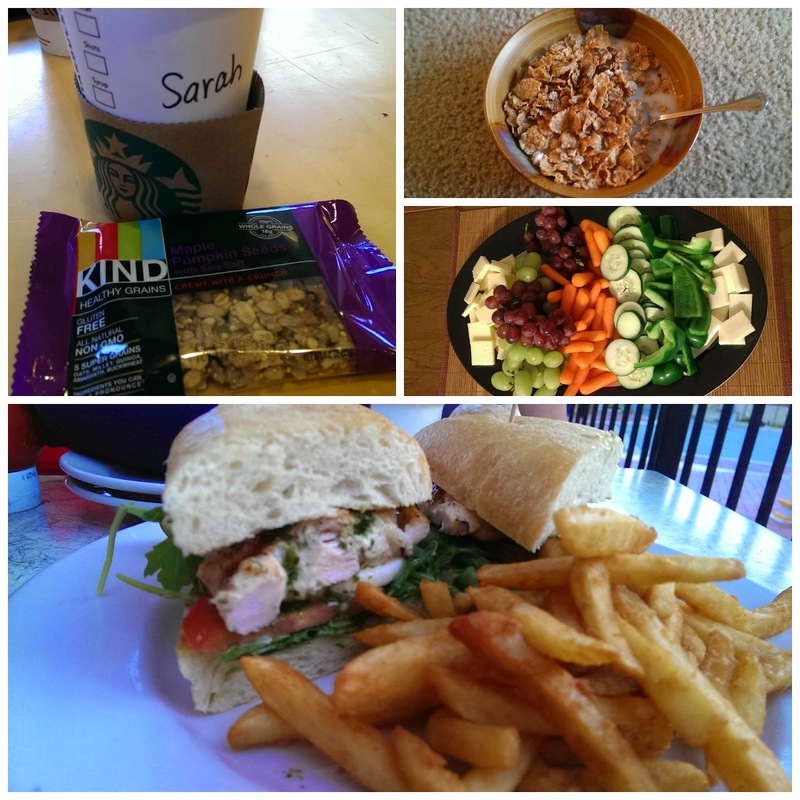 Panera Chai Tea Lattes, beef brisket, pulled pork, Nutella milkshakes, cereal for breakfast, french fries, wine, Starbucks coffees, KIND bars, and smoked chicken thighs. That's all I have to say about #eatallthefoods week. BUT! I will say that I did pretty awesome during Thursday Night Football. Football games are pretty tough for me as they typically revolve around food. However, I made a huge plate of fruit, veggies, and cheese with a few greek yogurt dips to snack on in addition to the turkey chili Matthew and I made for dinner. Though I ate more than I usually do on a Thursday night, it's nowhere near what I used to eat during a football game. Skinny Vanilla Latte, Special K Cereal, Veggies galore, crazy-good carb loading before Saturday's half. 155.2 as of 9/10/14 weigh-in. -46.8 since heaviest; 202 in 2005. A new week starts today! Let's get after it! QOTD: What's your favorite part about Monday? Can't wait to read your Divas Half Recap and hear about your MRI results. Sending good thoughts your way! Thank you so much! I really appreciate the good vibes! This waiting game is killing me! I look forward to your recap. Your carbo loading dinner looks so good! Oh it totally was! I'm a sucker for anything "caprese" related!